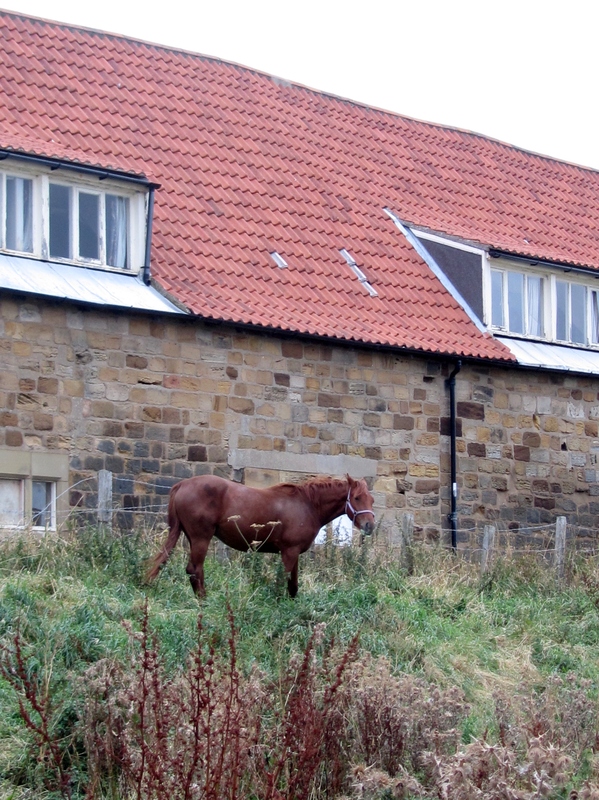 Yorkshire was the home county of the Bronte sisters – those damsels of the dark and windswept moors. Charlotte, Emily and Ann were born in the early 1800s and all were gifted writers who are still widely read today. Tragically, all three sisters and their brother died of tuberculosis; Emily and Ann were gone at about 30 years of age. Charlotte was almost 40 when she died in 1855 and was the most famous of the three in her day. For my part, I’m rather taken with tortured, brooding characters, so I’m thinking about Heathcliff from Wuthering Heights, Emily’s novel, as we ride the bus over the heathery moors of north Yorkshire. We are not going to make it to their home village of Haworth, but the grey skies and blowing wind bending the scrubby bushes helps me understand the inspiration for Gothic tales of love and revenge! The bus takes us through a delightful little village where a flock of sheep are wandering across the road near a picturesque train station. Goathland, I learn later, was the setting for Heartbeat, a popular drama about a rural police officer that ran for 17 years on British television. My better half films the sheep scattering as a tiny car races up the road, seemingly oblivious to their wooly presence. Clearly, this has happened before! 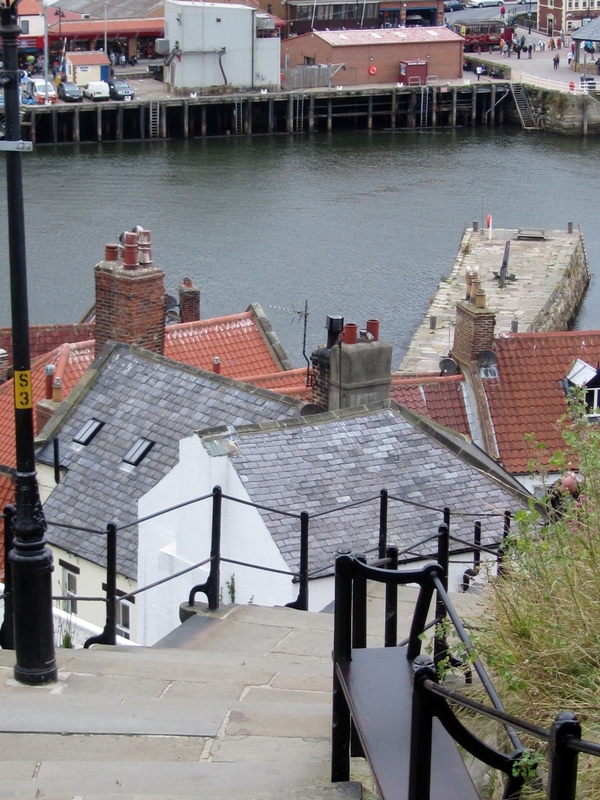 We arrive on the north Yorkshire coast at Whitby, one of seemingly endless charming villages and towns in England. 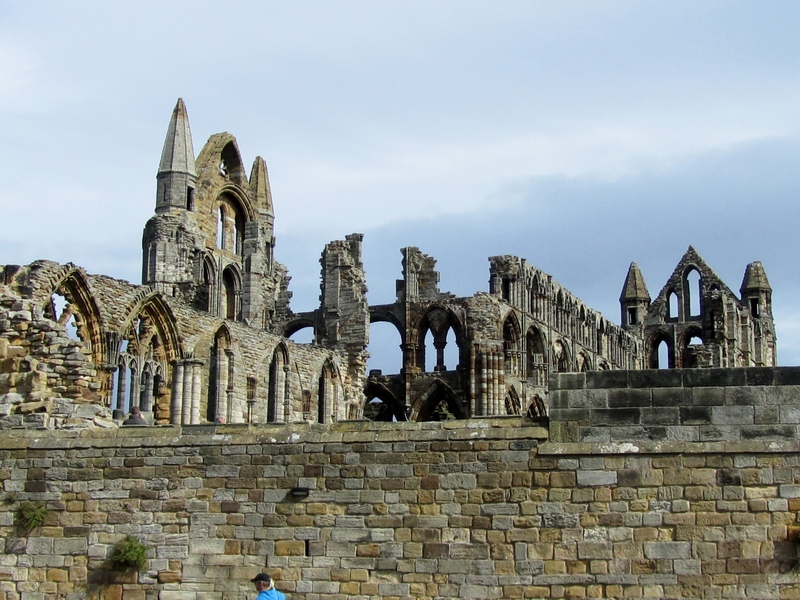 We came here to see the imposing ruins of Whitby Abbey, built on a hill overlooking the town. Next to it stands St. Mary’s Church, still in operation, whose windows are lit red by the setting summer sun, appearing to be burning eyes. 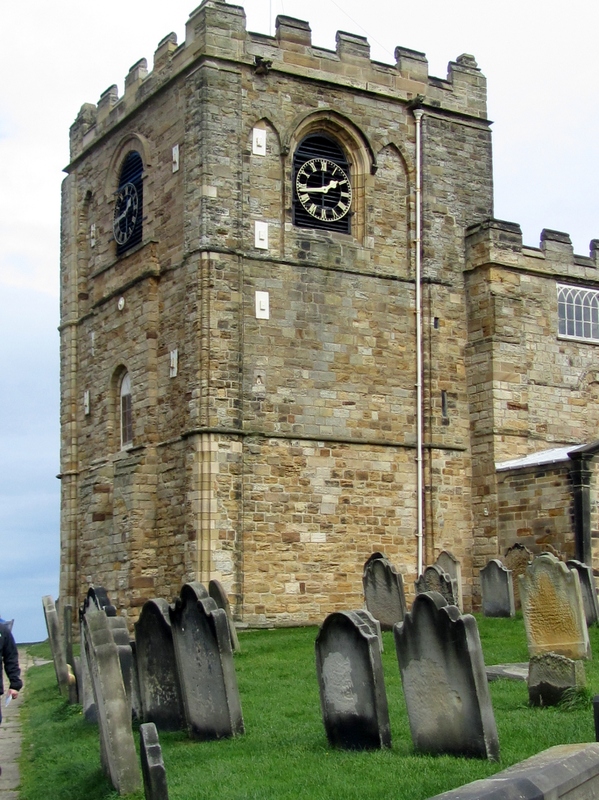 Bram Stoker stayed in Whitby, saw the windows, and wrote them into his novel Dracula. And the rest is, um, history. We walk up the 199 stairs to the church and the abbey ruins. An abbey has stood here since the 800s, but several were laid waste before the final building was caught up in Henry VIII’s dissolution of monasteries and was stripped and sold off in the 1500s. 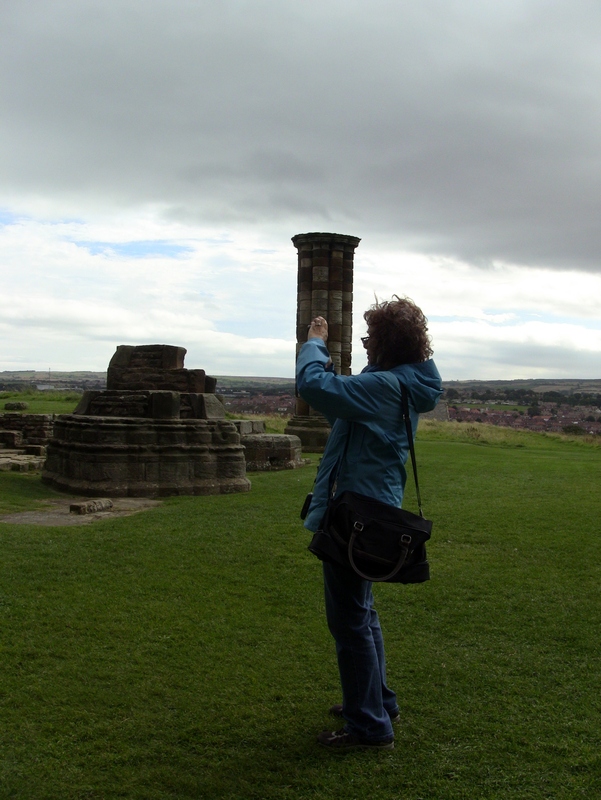 We cannot stop taking pictures of the stone skeleton, once a place of power and worship, now home for starlings. Down the stairs we walk through more uneven cobblestone streets and then out on the pier to see the Atlantic waves pouring through the breakwater. We are good and tired by the time we step back on the double decker for a two-hour ride back to York and our final day in England. And by the way … the title of this post comes from Edward Bulwer-Lytton, a Victorian writer fond of overwrought phrasing. There is a hilarious writing contest inspired by this author and you can learn more about it at www.bulwer-lytton.com. For my Canadian friends and family, you’ll find this article amusing: http://www.guardian.co.uk/culture/2008/aug/19/2. One last piece of writer’s trivia: Bulwer-Lytton was a great friend of Charles Dickens, so much so that Dickens named his 10th child – you guessed it – Edward Bulwer Lytton Dickens.